'Raging Tide' (Keith Keppel, R. 2006). Seedling# 99-84A. TB, height 38" (97 cm), Midseason to late midseason bloom. Standards blue (M&P 41-D-10), edged darker (41-C-9); style arms pale blue (41-B-7/8); falls medium violet-blue (41-F-11) center, 11/2" outer area pale blue (41-B-7/8); beards blue white tipped lemon, white tipped lemon in throat; very ruffled. 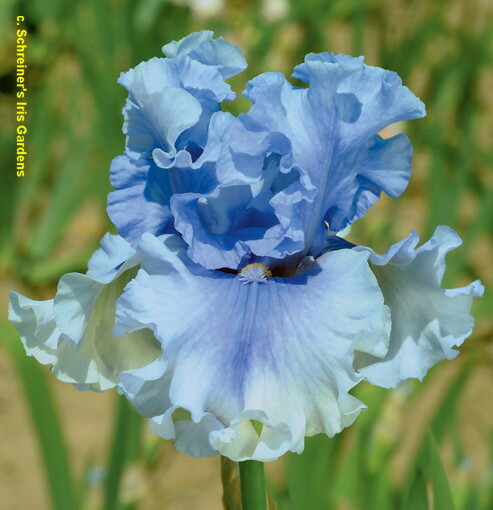 'Sea Power' X seedling# 97-77A: (seedling# 92-52A: ('Spring Shower' x seedling# 89-104AA: (seedling# 84-122A: ('Snowbrook' x 'Blackout') x 'Honky Tonk Blues')) x 'Rite Of Spring'). Keppel 2007. From AIS Bulletin #345 April 2007 Introducing RAGING TIDE ML 38" (Sea Power X ((Spring Shower x ((Snowbrook x Blackout) x Honky Tonk Blues)) x Rite of Spring)). Large flowers with swirling, frothy ruffles. Medium blue standards blending to pale blue toward edges, pale blue falls blending medium blue toward the center. Beards light blue, tipped yellow in the throat. #99-84A. $50.00. Keith Keppel.